Lisa Bradshaw received her B.S. in botany from University of Michigan and PhD in ecology from University of California at Davis, carrying out her dissertation research on alternative weed management options in Nicaraguan coffee orchards. 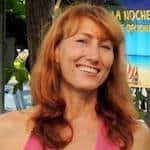 She spent the last 23 years in Costa Rica teaching, doing agro-ecological research and undertaking entrepreneurial adventures before returning to the U.S. She currently works as a lecturer at UM Dearborn and in Undergraduate Admissions at University of Michigan’s School of Business. Fifteen years ago, American Lisa Bradshaw became a social entrepreneur. But at the time, she didn't know it. When she launched the eco-conscious and locally sourced Green Screen in 2002, no other plant-based insect repellents were on the market in Costa Rica and certification requirements for organic products had just recently been legislated. Here are some of the hard lessons she picked up.